Peyia, Paphos - This lovely home is located in a quiet residential cul-de-sac in the popular area of Peyia within walking distance to local shops and restaurants. The beaches and amenities of Coral Bay are a 5 minute drive away. The property features a comfortable lounge, good size dining area, well equipped kitchen with breakfast bar and a guest cloakroom. On the first floor a spacious landing leads to three double bedrooms, all with fitted wardrobes. The master bedroom being the largest has an en-suite shower room and a balcony with lovely sea views. The second bedroom features a stylish domed ceiling. A family size bathroom with built-in vanity unit is accessed directly from the hallway. The outside areas are well designed to fully enjoy the fabulous outdoor life. A large covered veranda overlooks the swimming pool terrace and landscaped gardens with a central wooden pergola provides a wonderful shady haven for outdoor dining and entertaining. 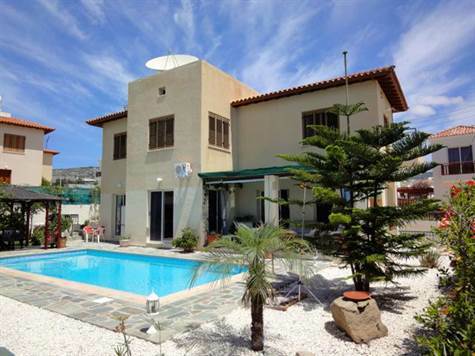 The property is in excellent condition with modern finishes and is ideal as a permanent residence or holiday home. Title deeds are available. Please refer to MLS #:1036 when inquiring.